This technique may one day prove invaluable in disaster recovery situations, as well as in noninvasive biomedical imaging applications. “Imagine photons as particles bouncing right off the walls and down a corridor and around a corner — the ones that hit an object are reflected back. When this happens, we can use the data about the time they take to move around and bounce back to get information about geometry,” explains Otkrist Gupta, an MIT graduate student and lead author of the Optics Express paper. 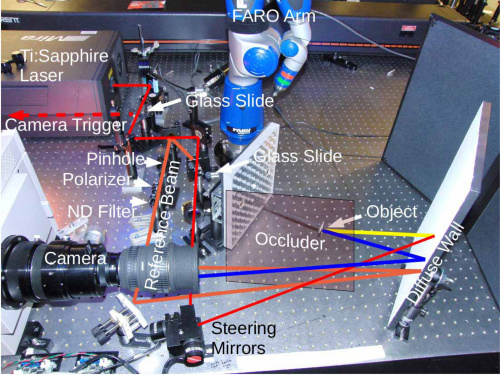 Using advanced optics in the form of an ultrafast laser and a 2-D streak camera, both of which operate on the order of trillions of cycles per second, the team exploited being able to capture billions of images per second to demonstrate the technology’s ability to “see” objects by analyzing the light moving around a corner or through a water bottle. Streak cameras differ from other cameras in that the image it forms is determined by the time profile of the incoming photons. “This type of imaging provides us with a very good idea of how long each of the photons takes to bounce and come back. If there’s something around the corner, the photons come back sooner and arrive earlier in time” says Gupta. “We’re actually capturing and counting photons. 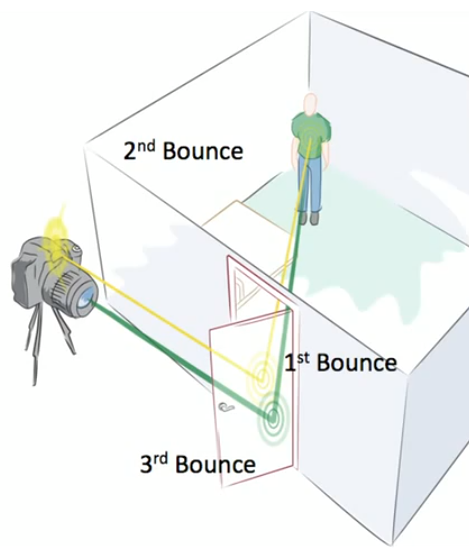 “Each image we shoot has three or fewer photons in it. And we take lots of images very quickly to create ‘streak’ images, which help us determine the distance traveled by the photons in centimeters. There are many potential applications for this technology. Among the more simple and obvious are disaster recovery situations. “Say you have a house collapsing and need to know if anyone is inside, our technology would be useful. It’s ideal for use in nearly any disaster-type situation, especially fires, in which you need to find out what’s going on inside and around corners — but don’t want to risk sending someone inside because of dangerous or hazardous conditions. You could use this technology to greatly reduce risking rescue workers’ lives,” Gupta points out. It’s also quite possible that the technology could be used as a form of noninvasive biomedical imaging to “see” what’s going on beneath a patient’s skin. That’s what the researchers plan to investigate now. Gupta expects that it will likely be at least another five to 10 years before the technology becomes commercially available, based on the typical timeframe research and development (R&D) demonstrations take to reach a product launch.